We are a family of personal injury attorneys that care and can assist you if you have been injured in an accident. Sweeney, Sweeny & Sweeney has successfully settled 95% of our cases. As an experienced Riverside County personal injury attorney, we have effectively serviced thousands of injury claims throughout our combined 45 years of service. We understand how difficult and painful an accident and dealing with an insurance company can be, which is why a dedicated personal injury lawyer from our team is here to help you find a fair resolution for your claim. If your life has been disrupted by an accident returning to your everyday life can be difficult when dealing with insurance companies and their attorneys. It can be an overwhelming experience filled with uncertainty and questions about your wellbeing, health care or resolve to your accident. You may be un-aware of your rights and means to a fair resolve when it comes to dealing with insurance companies or attorneys. After an accident, it can be stressful dealing with insurance companies and making decisions that may affect the rest of your life, especially when you are in pain. Each personal injury attorney from our experienced team of professionals are experts in personal injury law and can assist you in making informed decisions, better understand your rights and relieve the stress of dealing with insurance companies and their attorneys. Sweeney, Sweeney & Sweeny can advise you as to what the laws are and whether the insurance company is making you a fair offer to help restore your everyday life. Our family of injury lawyers has helped thousands of people in Riverside County with tragic and difficult accidents as you may be experiencing now. The insurance companies do not consider your suffering and the affects it may take on your life nor the burden of struggling to return to everyday life. You do not have to fight the battle of insurance company bureaucracy alone - contact a committed personal injury lawyer from our firm today to learn more about how we can help! We service: Temecula, Murrieta, Hemet, Wildomar, Lake Elsinore, Perris, Canyon Lake, Menifee, Sun City, Moreno Valley, Nuevo, San Jacinto and throughout the Riverside County. 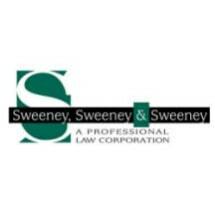 Sweeney, Sweeney & Sweeney is a family of attorneys which includes William Sweeney and his two sons, Michael Sweeney and Robert Sweeney. We have 45 years of combined experience in helping injured people receive the compensation they deserve.